Have you seen all the articles saying how wonderful hiking is for your health? It literally changes our brains! The neural activity in your subgenual prefrontal cortex will never be the same! I’ve heard enough of those claims. Sure, your body will see some great benefits for a few months, but most of them are short-lived. Here’s 12 ways that a thru-hike can be detrimental to your health. Your mother was right, you should have stayed home. 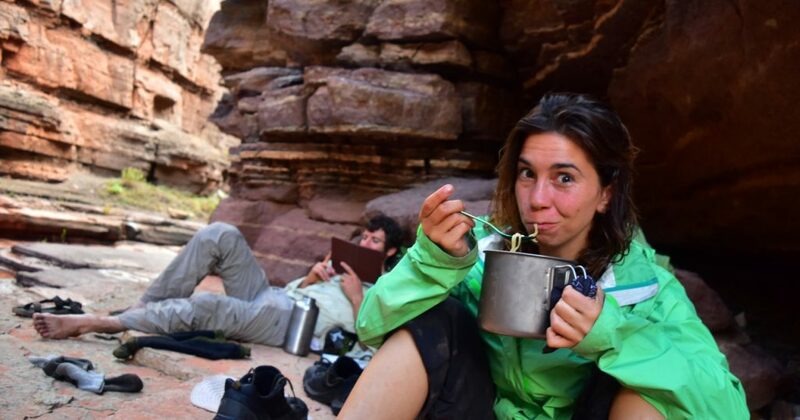 Do you brush your teeth twice a day when you’re backpacking? Face it, chronic hikers are more likely to have bad teeth. Didn’t you know oral hygiene is critical for your overall health? Besides the obvious downfalls, the financial cost and anxiety over getting your teeth fixed later in life will cause a lot of stress. If you go hiking a lot, you’re going to get a lot of sun. Sure, you can try wearing a big hat or smearing sunscreen all over yourself, but all those chemicals are probably even worse for your skin. You may do the best you can with big hats and and such, but there’s ultimately no way around it. You’re going to get a lot of sun. All those new moles and weird blemishes on your face after a thru-hike can’t be good. On a thru-hike you’re basically swimming in a sea of ticks (They carry a lot fun stuff besides Lyme, too). This 2018 New York Times article claims that moose carry, on average, 47,000 ticks! And guess what, you’ve just volunteered to share their environment for several months on end. Brilliant. Lyme has been around for almost 40 years (First identified in Connecticut in 1982) and scientists still have no vaccine, no diagnosis, and no cure… but they can land a space probe on Mars. Go figure. Everything you’ll ever read about Lyme is vague and disturbing. For example, consider the classic bulls-eye rash. It’s thought to be the most sure-fire and consistent way to know you’ve contracted it. But now here too, doctors have stepped back, thrown up their hands, and admitted that a rash won’t always show up. The only thing that is certain about Lyme disease is that it will screw up your life, big time. Think about how long you wear your backpack and how much it squeezes your belly. Now think about all the important stuff down there – bladder, appendix, uterus, prostate, etc. (I hike a lot and no longer have an appendix, by the way). I can’t imagine how squeezing those organs so hard for so long can have a happy ending. Diapers for the elderly aren’t just a joke – it’s a real thing. Go ahead and lower your pack weight all you want. Use hiking poles, do everything you can. There’s no avoiding it – you’re knees are going to take beating. They’re not designed to carry an extra 40 pounds of nylon and Ziploc bags. I hiked the Appalachian Trail when I was 20 years old, when I still thought my body was bulletproof. My knees have never been the same. 6: Hikers Don’t Wash Their Hands After They Poop! Browse 20 gear lists from the experts online, and you’ll be hard-pressed to find hand sanitizer on a single one of them. It just can’t wait to move in to its cozy new digs. You can filter all your water as religiously as possible. Pour as much chlorine and bleach into it as you like. Giardia survives in just a single drop of water. Sooner or later, it’s going to find you. If you just stayed in the Shire, these things never would have happened. Adventures are uncomfortable and make you late for dinner. And rabies is a real thing. 9: You’re more likely to drink and smoke weed. Thru-hiking makes you feel like a rock star, but you are not Keith Richards. You didn’t sell your soul to the devil. Hiking culture is the beer and marijuana culture. What’s more quintessential after a long hike than a cold beer? Throw caution to the wind, and sooner or later you may discover that you’ve become an alcoholic. Lung disease and liver damage aren’t cool. In case you haven’t heard, the American West is hell-bent on relentlessly burning to the ground each summer. Continental Divide and Pacific Crest Trail hikers can expect to live in a smoky environment for a looooong time. Inhaling all that smoke can’t be good. 10: Binge Eating creates bad habits that are hard to break. Show me a 2019 thru-hiker, and I’ll show you the fat person they’ve become in January of 2020. One of the most widely referenced benefits of thru-hiking is that you can eat whatever you want! It’s true – you won’t gain any weight, but trans-fat has a way of sticking with you. Worse than that, you’ll establish the bad habit of eating whatever you want, and as much of it as you want. You’ll be starving most of the time, so it’s virtually impossible not to get into bad habits. When your hike is over, you’ll find that these habits are a lot harder to break. My first long trip was 18 years ago, and I still have no qualms about eating an entire large pizza in one sitting. That can’t be good for me. 11: If you’re depressed, thru-hiking only makes it worse. Let’s just assume that most people who go backpacking for six months aren’t at the most stable juncture of their lives. Your hike is amazing. You make friends, get into shape, and find a purpose in your life through moving forward, down the trail. You feel wonderful and think you’ve discovered all the answers. But sooner or later, even if you’re one of the lucky few to finish the trail, your hike has to come to an end. You go home and your world crashes down when you discover that nothing’s really changed at all, except for your bank account. Running from things doesn’t make them go away. You’ve convinced yourself that you’ll take all the lessons from the trail and bring them home, into your real life. Surprised? It’s not your fault. You know how the National Park Service wants you to find your park? You know what the NPS is? So please don’t find your park. Stay out of the woods and off the trails. It’s for your own health. And share this article – you could save someone’s life! But please don’t share it with my mom. 12: Your hiking isn’t healthy for your mom. It’s called anxiety, and she worries about you enough already. So true. Everyone (else) STAY HOME!